Give Your Cats The Gift Of Love – Book A Cat Sitter In Muncie! Imagine it’s Valentine’s Day (or any day you want to get out of the house and not worry about your cat or other pets). You have a romantic evening planned with your sweetie and you make plans to book a cat sitter in Muncie. Once you’ve got everything squared away and your pet care forms complete, your consultation is set and your cat sitter arrives. She’s immediately greeted by your lovable and very vocal kitty, Smokey. He begins zipping in and out of her legs. He swishes his tail and looks up at your cat sitter with adoring eyes. When she sits down he plops in her lap. Sounds like your kitty is happy, right? This is exactly what we like to see – happy cats and happy cat guardians! Our cat sitting services are available for any holiday, including Valentine’s Day. We take care of cats in the Anderson, Yorktown, New Castle, Pendleton, Hartford City and Indianapolis, Indiana also. Book A Cat Sitter In Muncie – Give Your Cats The Gift Of Love! A happy cat is what I see every. single. time I visit Smokey, the beautiful grey kitty in the video below. He’s always happy I visit and can never resist laying on my lap. He has oodles of love to give and I’m happy to be on the receiving end! Do all of our cat clients act like this? I wish they all did but unfortunately that’s not the case. What If My Cat Isn’t Friendly? When we encounter shy cats, we give them space. Chasing them and hunting them down will often cause more harm then good so we’ll make sure they’re eating, pooping and peeing. You can schedule cat sitting services by visiting this link if you haven’t used our services before. Current clients can book cat sitting visits here. Updates are just a call or text away! 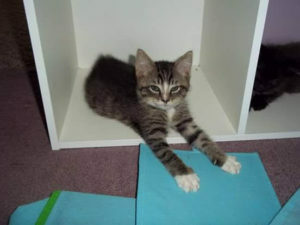 Book a cat sitter in Muncie, call 765-744-5688 or visit www.sit-stay-play.com. Keeping your cat home is a good choice. Why? Because most cats prefer to be home where they’re comfortable. Keeping them home is less stressful on them, especially older cats. Book a cat sitter in Muncie, Anderson, Yorktown, Daleville, New Castle, Pendleton, Fishers, Carmel, Noblesville and Indianapolis areas. P.S. Book a Muncie cat sitter in Muncie for spring break, summer and any holiday quickly. Click this link to complete your pet care forms online. Is Your Valentine Your Dog? ⟵Want To Board Your Dog In Someone’s Home? Ask These Questions First!